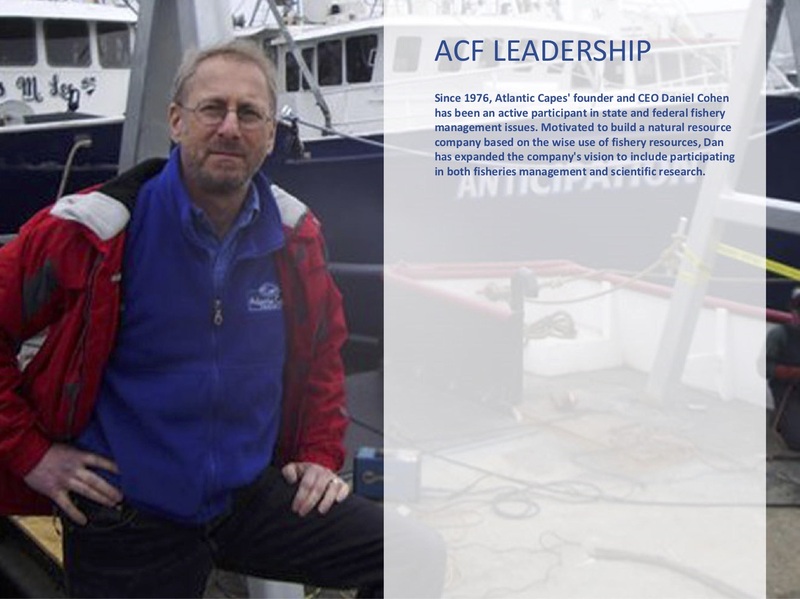 November 21, 2018 — With sadness, Saving Seafood reports the passing of Daniel M. Cohen, founder and CEO of Atlantic Capes Fisheries, Inc. Danny was a longtime supporter of Saving Seafood, our National Coalition for Fishing Communities, and our member organizations, including the Fisheries Survival Fund and the Garden State Seafood Association. Danny was featured in a 1997 New York Times profile, “Not on Board, but at the Helm,” and in 2014 testified before the U.S. Senate on the effects of climate change on wildlife and agriculture (he appears in this C-SPAN video beginning at approximately 1:19:30). Daniel Myer Cohen, a pillar of the East Coast commercial fishing industry, and an eloquent spokesperson for commercial fisherman throughout America, died on November 20, 2018 in Cape May, NJ, at the age of 63, after a protracted and heroic struggle with cancer. “Danny,” as he was known, took over the small fishing-dock and several fishing boats left to him by his father, Joseph Cohen, in 1976 and built it into Atlantic Capes Fisheries, Inc., an industry leading vertically integrated seafood enterprise. ACF’s fleet of scallop, clam and other fishing vessels working out of company owned and managed facilities in Ocean City Maryland, Cape May and Point Pleasant New Jersey and additional ports in New England, supply seafood to company owned processing plants in Rhode Island and Massachusetts. Early in his professional life and in his emerging role as a public advocate, Danny recognized that ensuring a sustainable wild harvest industry depended upon responsible environmental and resource stewardship. Among other activities in the field of fisheries science, policy and management, Danny appeared before Congress and served as Chairman of the National Fisheries Institute (NFI) Scientific Monitoring Committee and on the NFI Clam Committee, both of which work to sustainably manage the major shellfisheries of the mid-Atlantic region. Illustrating the advancing impact of applied research to the seafood aquaculture, in the 1990s Danny began working with Rutgers University and founded Cape May Salt Oyster Company, re-vitalizing the Delaware Bay oyster industry by growing disease resistant shellfish whose triploid oysters, championed early on by the slow food movement, can be found on the menus of some the nation’s finest restaurants. Tetraploid technology which is also being applied to scallop aquaculture is revolutionizing shellfish production across the globe. Whether in aquaculture, wild harvest, processing and marketing, offshore wind development or a host of other projects spanning the globe, Danny Cohen has been a leading light for over 4 decades. Danny is survived by his daughter Dorit with ex-wife Mindy Silver, his sister Maxi, brother Barry and sister-in-law Ronnie; his nephew, niece and cousins; companion Sharon and by the many friends he has made in the seafood industry; the captains and crew that are the company’s lifeblood and by the nearly 500 member ACF family that Danny helped to build and nurture. The family also extends its gratitude to the home health aides from Synergy HomeCare as well as the hospice nurses and staff from Holy Redeemer Hospice. A funeral will be held Sunday November 25th at 10:30 am at Shirat HaYam located 700 N. Swarthmore Avenue in Ventnor NJ. Shiva will be held at the home of Barry and Ronnie Cohen in Linwood NJ. In lieu of flowers, charitable contributions in Danny’s memory can be made to the Sarcoma Foundation of America to help fund research into Sarcoma cancers. Arrangements are made by Roth-Goldsteins’ Memorial Chapel. August 30, 2018 — The New Bedford fishing industry rolled out the red carpet Wednesday for Beth Lindstrom, one of three Republicans locked in a primary battle to see who will go up against incumbent Democratic Senator Elizabeth Warren. Lindstrom’s first visit to the fishing industry was arranged by Saving Seafood, a Washington, D.C.-based industry advocacy group founded by New Bedford native Bob Vanasse. The half-day-long visit began at the BASE seafood auction on Hassey Street, owned and operated by Richard Canastra. There, buyers and the general public can watch as fish are auctioned off electronically, a far cry from the old system of chalk on a blackboard. Lindstrom, former executive director of the Massachusetts State Lottery, mainly asked questions and listened to fishing industry representatives who told her of the difficulties they have with federal regulations. An added concern, they said, is the pending construction of huge offshore wind energy farms that they say will keep fishing boats at bay to avoid the risk of entanglement. The case of Carlos Rafael, known as The Codfather, was also brought up because of the hardship that the government imposed on fishing boats in sectors 7 and 9 and on-shore services who weren’t involved in Rafael’s misdeeds. Rafael is serving a 46-month federal sentence on charges including conspiracy, false labeling of fish, bulk cash smuggling, tax evasion and falsifying federal records. July 24, 2018 — Senior Interior Department officials prepared last fall to eliminate the Northeast Canyons and Seamounts Marine National Monument — even as they had yet to agree on the public justifications for doing so, according to newly disclosed internal documents. Interior last week accidentally released thousands of pages of unredacted internal emails in response to Freedom of Information Act requests. Copies of those emails, provided to E&E News by the Center for Western Priorities, detail Interior’s strategy — including a focus on timber harvesting, mineral rights, and oil and gas extraction — as it reviewed the boundaries of more than two dozen national monuments under an executive order from President Trump. The documents also disclose internal deliberations over the future of some marine monuments, including reintroducing commercial fishing to some sites and reducing the boundaries of others. In [a] September email, [Interior official Randy Bowman] advised that Interior strike data on commercial fishing in the [Northeast Canyons and Seamounts monument]. A deleted sentence states that four vessels in 2014-15 relied on the monument area for more than 25 percent of their annual revenues, while the majority of ships generated less than 5 percent of their revenues from the area. “This section, while accurate (except for one sentence) seems to me to undercut the case for the commercial fishing closure being harmful. I suggest in the attached deleting most of it for that reason,” Bowman wrote. Saving Seafood Executive Director Bob Vanasse disputed the idea that data didn’t support the repeal of the commercial fishing ban but said it instead was removed because it could be taken out of context. “While it is generally accurate, if one looks at the entire fishing industry in the region, to make the statement that only a small number of vessels derive more than 5 percent of their revenue from the Monument area, for those vessels and fisheries that conduct significant portions of their operations in the monument area, the economic harm is significant,” Vanasse said in a statement. June 28, 2018 — U.S. Congress delayed taking action this week on a bill that would reauthorize the Magnuson-Stevens Act. H.R. 200, which would have extended the fishery management law until fiscal year 2022, has been held up in Congress by more than two-dozen amendments to the bill. Instead of a vote this week, multiple seafood industry and environmental representatives told Seafoodsource they now expect a vote after the House of Representatives returns from its Fourth of July break. At a House Rules Committee hearing regarding the bill on Monday 25 June, lawmakers introduced 27 amendments to it. What the delay means for the bill’s chances remains unclear. However, both the bill’s advocates and its opponents will use the time to continue their full court press on lawmakers. The bill, formally titled the “Strengthening Fishing Communities and Increasing Flexibility in Fisheries Management Act,” would extend the MSA through the 2022 fiscal year. However, in its current form, it would also make substantial changes to the act. Among those who support the bill are members of the East Coast and West Coast of Saving Seafood’s National Coalition for Fishing Communities. They say the bill will create a fisheries management program that is both flexible and conservation-focused. June 12, 2018 — WASHINGTON — Leading aquaculture experts discuss what sustainability looks like in farmed fishing and how we achieve it in the latest episode of Saving Seafood’s video series, Aquaculture Today. According to the Sustainable Fisheries Partnership’s 2017 overview of reduction fisheries – fisheries used for the production of fishmeal and fish oil – just over 83 percent of global catch from reduction fisheries comes from stocks that are reasonably well managed or better. Only an estimated 17 percent of reduction catch comes from poorly managed fisheries. According to Manuel Barange, Director of Fisheries and Aquaculture at the UN Food and Agriculture Organization, the goal of sustainability should not be maintaining the status quo, but ensuring that aquaculture will be able to feed the world’s growing population while protecting marine ecosystems. “Sustainability means to understand the needs of the people for this generation and in future generations, and therefore how to protect the marine environment and the freshwater environment so that they keep producing,” says Mr. Barange. Experts also stressed the importance of more data to help fisheries managers make informed decisions about aquaculture, as well as the need for continued industry involvement. “Fishery management is better the more data we can get, the more accurate modeling that we can get,” says Neil Auchterlonie, Technical Director at IFFO. “Doing good science, having good industry participation, and recognizing that when there are challenging issues, that collaboration within the industry is probably one of the best ways to solve them,” says Tim Fitzgerald, Director of the Environmental Defense Fund’s Impact Division. The video is the fourth and final in a series, Aquaculture Today, in which Saving Seafood interviews leading aquaculture experts about advances in farmed fishing and what the industry will look like in the future. Previous episodes of Aquaculture Today covered its role in feeding the world, its efficiency, and the nutritional benefits of omega-3 fatty acids. Interviews for Aquaculture Today were conducted by Saving Seafood at the 2017 SeaWeb Seafood Summit in Seattle, Washington. June 6, 2018 — WASHINGTON — Through new techniques and technologies, farming fish is becoming increasingly efficient, leading aquaculture experts tell Saving Seafood in a new video. “With a whole range of factors – improved nutritional knowledge, better management techniques of feeding on the farm, and all of that – [the fish in–fish out] ratio has gone down,” says Andrew Jackson, Chairman of IFFO RS. In the case of salmon farming, nutritionists are using alternative ingredients, including plant proteins like soy, and mixing canola and other vegetable oils in with pure fish oil. This has helped lowered the percentage of marine ingredients in fish feed to about 25 percent of farmed salmon diets, and projections are that this will drop below 10 percent by 2025. “They’ve figured out that the key to being successful and profitable and sustainable is not necessarily to catch more fish, it’s to extract as much value as possible out of the right amount of fish,” says Tim Fitzgerald, Director of the Environmental Defense Fund’s Impact Division. These improvements have made farming fish one of the most sustainable forms of protein production, experts tell Saving Seafood. The video is the second in a series, Aquaculture Today, in which Saving Seafood interviews leading aquaculture experts on the latest advances in farmed fish, and its role in the world. Saving Seafood released a video yesterday on aquaculture’s role in feeding the world’s growing population. In addition to Mr. Jackson, Mr. Lee, Mr. Fitzgerald, and Mr. Barange, the video also features Julien Stevens, Researcher at Kampachi Farms, and Neil Auchterlonie, Technical Director at IFFO. June 5, 2018 — WASHINGTON — Global poverty and malnutrition are falling worldwide, and the availability of affordable, healthy protein is a key reason why. Aquaculture, as one of the world’s fastest growing sources of food production, has been an essential part of this development. Saving Seafood is taking a closer look at the role that aquaculture plays as a source of food, nutrition, and employment for millions of people around the world in a new series, Aquaculture Today. We interview leading aquaculture experts on the latest breakthroughs and developments in farmed seafood, and the role it plays in the future of human health and the global food supply. Worldwide, protein consumption has more than doubled in the past 50 years, going from 9 kg per person per year to nearly 20 kg per person per year. Fish, as a cheap and readily accessible food source, has made up a large share of global protein consumption. As the demand for affordable sources of protein grows along with the world’s population, these fish are increasingly being produced through aquaculture. The importance of aquaculture to global seafood production is only expected to increase, with the production of farmed seafood expected to dwarf that of wild-caught seafood in the next 15 years. “The projections are that we’ll reach 62 percent of food fish coming from aquaculture by around 2030,” says Dan Lee, Standards Coordinator for the Global Aquaculture Alliance’s Best Aquaculture Practices Program. This growth presents an opportunity for fishing communities, which have a chance to diversify to meet the needs of the global seafood market. “One thing that I would really like to see the industry support [NOAA] stepping up with is dealing with this sort of issue, trying to help these communities start to either diversify their fisheries or thinking more about how they can move into aquaculture,” says Richard Merrick, former Chief Scientist at NOAA Fisheries. Aquaculture Today comes from interviews conducted by Saving Seafood at the 2017 SeaWeb Seafood Summit in Seattle, Washington. May 14, 2018 — NOAA – the National Oceanic and Atmospheric Administration – needs its leader! President Trump nominated Barry Lee Myers, the CEO of AccuWeather, to the post in mid-October. The Senate Commerce Committee has twice advanced Myers’ nomination to the full Senate. All that’s needed to fill this important job is a majority vote on the Senate floor, which both Democrats and Republicans expect to happen. Unfortunately, partisan politics keeps getting in the way, delaying the vote. Why is moving this along important? The Atlantic Ocean’s hurricane season begins June 1; tornado season has already started. In the first few days of May alone, 18 tornadoes were reported in Kansas, Nebraska and Oklahoma. In addition, 117 severe storms ravaged the Plains. The experienced professionals at NOAA can deal with the daily challenges of severe weather. But bigger decisions to carry out congressionally mandated improvements in hurricane and tornado forecasting require the authority of a Senate-confirmed nominee. As does putting a new hurricane-hunter plane into operation and prioritizing seasonal forecasts for farmers and ranchers. The nation also has a huge seafood trade imbalance that needs the attention of top NOAA leadership. Few people are as qualified to head NOAA as Barry Myers. He has successfully headed a large, complex, science-based organization that is one of the country’s – and the world’s – leading creators and distributors of weather forecasts, data and scientific information. In other words, Myers is a veteran executive in the areas in which NOAA operates. Myers also has worked for more than 30 years to make NOAA a better, stronger and more transparent organization. He helped establish the American Weather Enterprise, which combines the resources of NOAA, academic and research institutions, and America’s private-sector weather companies. The federal government works with industry leaders including Myers to distribute weather data free of charge to the American people. In fact, Myers has been repeatedly honored for helping to bring to the nation these major advancements, making the U.S. the envy of the world in how it provides weather information to its citizens. Senate offices have received more than 60 letters from individuals and organizations supporting his confirmation, including strong backing from the past four leaders of the U. S. National Weather Service who served under both Democratic and Republican administrations. In addition, the seafood industry has overwhelmingly advocated his confirmation with letters of support from seafood processors and others in the fisheries industry ranging from ship captains to sport fishermen. Members of Saving Seafood’s National Coalition for Fishing Communities consider Myers’ experience at the helm of a family-based business to be a special asset for his role at NOAA. They recognize this connection as a skill set no other leader of NOAA has had. Many American seafood-harvesting and processing companies are multi-generational, family-based businesses and his understanding of them is unique. While individuals with impressive scientific credentials have led NOAA in the past, the coalition believes Myers brings to the agency much-needed leadership, vision and managerial skills.